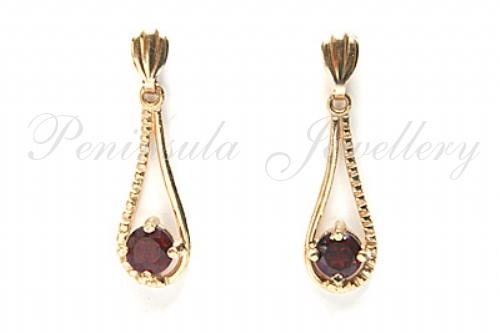 Pretty teardrop earrings, each featuring one 4mm round brilliant cut Garnet gemstone, claw set into a cut out teardrop design - half polished and half rope effect to give a stunning finish. Complete with fan fronted posts and scroll backs. Total dimensions: 22mm drop, 7mm wide at the widest point. Made in England. Supplied in a luxury gift box - Great Gift! !